This is one of my ALL TIME favorite scenes from a televison show. Go Mrs. Sugarbaker! Couture week just wrapped up in Paris. Jean Paul Gaultier did a 50’s rocker themed show as a tribute to Amy Winehouse. Karl Lagerfeld’s runway for Chanel was turned into an airplane isle. I like the idea of an airplane set but the cloths were blah at best. I don’t know what Chanel was aiming for but the arrow missed the mark by a long shot. Couture should be over the top inspired evening wear not sequin stewardess uniforms. Donatella Versace presented was her first Paris show since 2004. The best way to describe Versace’s show is Kim Kardashian meets Judy Jetson. Although I like Kim, I don’t mean that as a compliment. [in case there was any confusion] The best came from Elie Saab and Giambattista Valli. The former was a collection that was made for the Oscar red carpet. 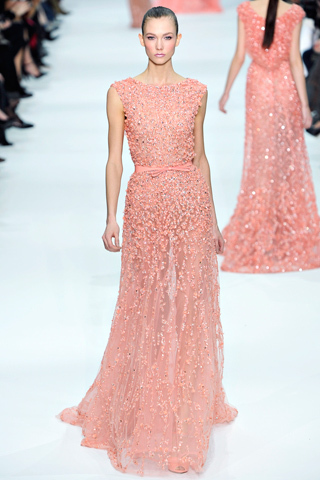 I guarantee that we’ll see at least one Elie Saab couture gown on February 26th. Couture creations are neither ment for real life nor real people and that’s beauty of it. I should also state for the record that couture doesn’t always mean cute. I’m talking to you Karl and Donatella. My final thoughts: You don’t need to stop using the word but if pressed now you can speak intelligently to the true definition. As we waited for a table at P.F. Chang’s, a friend of mine pulled up this music list on his phone and we started reminiscing. It’s one of those list that makes you think, “Oh yeah, I remember that song!” It also reminded me that En Vogue had a couple great songs back in the day. Maybe it’ll make you revisit your iTunes account for some downloading. Enjoy! 29. If I Had No Loot – Tony! Toni! Tone! 34. It Never Rains (In Southern California) – Tony! Toni! Tone! 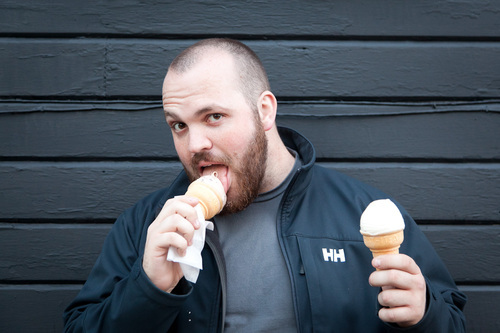 Now I want some icecream. The Golden Globes were last nigth and over all most of the stars looked great. There were very few (if any) severe misses. 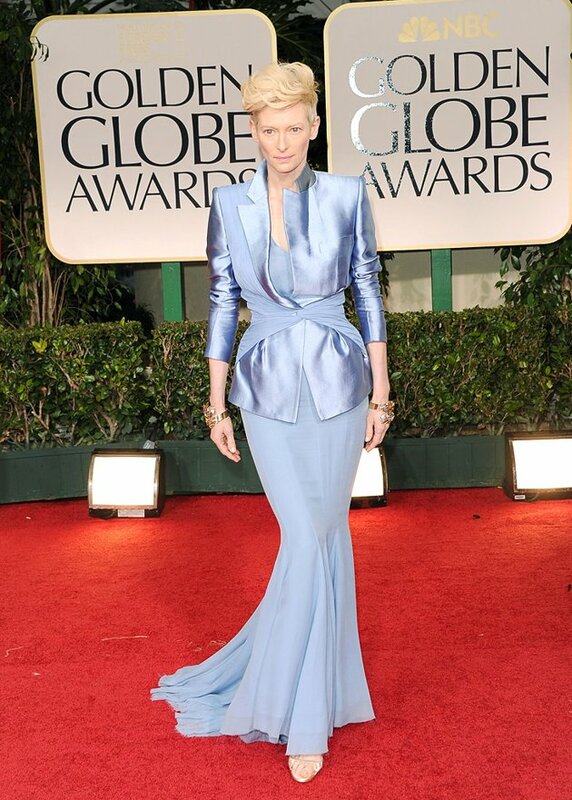 Not surprisingly, my favorite was Tilda Swinton in blue Haider Ackermann. You probably haven’t heard of Achermann, but his designs are edgy and extemely fashion forward. (The word trendy doesn’t even begin to describe him) The ‘I Want to be Her Best Friend Award’ goes to Sophia Vergara. She’s so funny and sweet. It’s also great when she tries to pronounce Wang. 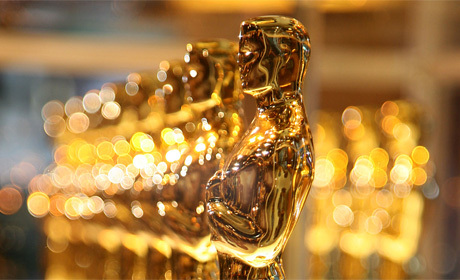 Julianne Moore and Nicole Kidman were also favorites. Charlize Theron continued her fashion winning streak with Dior Couture. That’s how a beaded headband should look. Yes I’m talking to you Michelle Williams. Emma Stone rocked a purple Lanvin dress with an eagle belt that added a little edge. ﻿Kelly Osborne. I’m so on the fence with this one. I love the color of her Zac Posen gown and I even like her silver hair. (you read that correctly, silver) BUT… the look is to old for her and there is just so much fabric. I could Photoshop Helen Miren’s face on this picture and you’d never know the difference. I wish it was sleeveless to make is skew a little younger. Leah Michelle was guilty of the same crime. Her silver Marchesa dress was to old and to much. Although I loved her hair and makeup. Everyone on TV gushed about how gorgeous Angelina Jolie looked. I hated it. First she had matching red lips, purse, and colar… Gag! Second, Natalie Portman did the same look last year and guess what, I hated it then too. Poor Sarah Michelle Gellar. She said in an interview that her child daughter picked out her dress. Mistake number one. I actually like the blue swirl print, but the shape of the dress is to big and poofy. Here’s a tip: if you’re working a large print, the cut of the dress should be simple. If you put that patern on the shape of Angelina’s dress (minus the red colar) it could be a knock out.